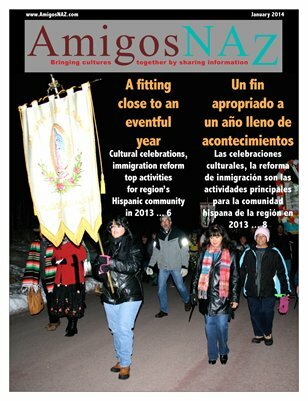 The January 2014 bilingual edition of AmigosNAZ opens with a cover story on the key role the Hispanic community played in the region's cultural and immigration reform political scene in 2013. The edition also includes a commentary on an award earned by the youth-driven Manifesto Project, which seeks to create the leaders of tomorrow; information on Coconino County Community Services' "Basic Business Empowerment" class beginning Jan. 11; details on "Exemplary Teacher" awards presented to five Northern Arizona University alumni; cold weather tips for pets and livestock provided by Coconino County Health Services District; information on healthy resolutions for the year ahead; ideas to help children transition from a crib to a bed; ideas on how to flood proof your home; and suggestions for cooking healthier comfort foods. All this and more brought to you by AmigosNAZ — Providing information for and about the vibrant Latino community in Northern Arizona.